Utopia collection features topographic and organic forms inspired by California's coastal landscape. The carved bronze technique is juxtaposed with glass to evoke sensual drama and raw glamour. 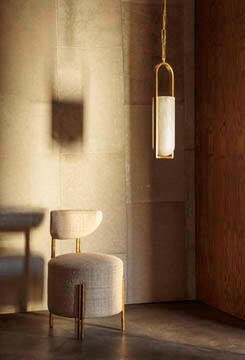 The Nouvel Small Pendant is minimal yet bold, highlighting the juxtaposition of mixed-materiality and curvilinear form. This double pendant is available in Antique Brass, Polished Nickel or a combination of Bronze and Brass, each featuring a White Glass globe. This fixture is rated for damp locations.